Blue Rider Press, 9780399171642, 304pp. "What if a man is placed in the Federal Witness Protection Program against his will? " "And doesn t even know what he supposedly knows that merits a new name, a new identity, a new life?" Jay Johnson is an Average Joe, a thirty-something guy with a job in telephone sales, a regular pick-up basketball game, and a devoted girlfriend he seems ready to marry. But one weekday afternoon, he's abducted on a Los Angeles Metro train, tranquilized, interrogated, and his paper trail obliterated. What did he see, what terrible crime or criminal is he keeping secret? It must be something awfully big. The trouble is, Jay has "no clue. " Furious and helpless, and convinced that the government has made a colossal mistake, Jay is involuntarily relocated to a community on Catalina Island which turns out to be inhabited mainly by other protected witnesses. Isolated in a world of strangers, Jay begins to realize that only way out is through the twisted maze of lies and unreliable memories swirling through his own mind. If he can locate or invent a repressed memory that might satisfy the Feds, maybe he can make it back to the mainland and his wonderful, even if monotonous, life. 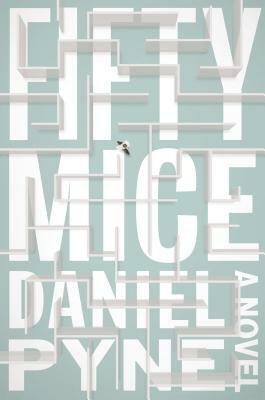 Set in a noir contemporary L.A. and environs, "Fifty Mice" is a Hitchcockian thriller as surreal and mysterious as a Kafka nightmare. Chilling, paranoiac, and thoroughly original, it will have readers grasping to distinguish what is real and what only seems that way. DANIEL PYNE s screenwriting credits include the remake of "The Manchurian Candidate, Pacific Heights," and "Fracture." He made his directorial debut with the indie cult film "Where s Marlowe?" Pyne s list of television credits (writing and showrunning) is vast, and includes J. J. Abrams s "Alcatraz" and "Miami Vice." His two previous novels, "Twentynine Palms "and "A Hole in the Ground Owned by a Liar," were published by Counterpoint Press. He lives in Southern California."